eBay a touchscreen, get your fingers flexed, and you can use this to control drum patterns or other sequences! Windows only, but a Mac version is possible in future, especially if you go tutor Froggy in the ways of Objective C. Thanks, Froggy! 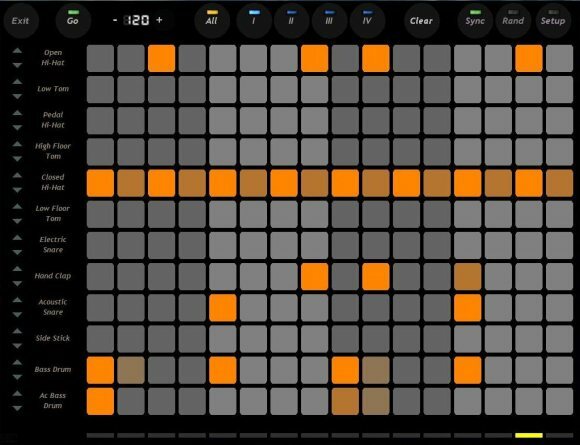 There’s some similarity to the Monome hardware project, but with the flexibility of a software interface. With touchscreens going for just a few hundred dollars, I hope this is just the first of many experiments. The possibilities for environments like Max/MSP and Reaktor are intriguing, too: as opposed to something like the Lemur, a real computer display means you can program the device to look and function however you desire. So, here’s the next question: anyone got suggestions on inexpensive touchscreens, or even better, good ways of retrofitting something like my portable 17″ Shuttle display with touch?